• An amazing 48 grams of Power Pro™ (our unique engineered protein matrix derived entirely from whey). • A moderate amount of energizing low glycemic complex carbohydrates. 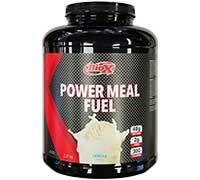 POWER MEAL FUEL™ is designed for ease of use. It mixes easily in seconds for a rich, frothy, satisfying shake. No blender or shaker cup is required. POWER MEAL FUEL™ contains a high level of naturally occurring Glutamine (approximately 8 grams per serving) and a high level of Branched Chain Amino Acids (over 10 grams per serving). • Contains added fibre from FOS (fructooligosaccharides). • Contains 2 grams of added pharmaceutical grade L-Glutamine per serving. • Contains our special digestive enzyme blend consisting of: bromelain, lactase, amylase, protease. Ingredients: Power Pro™ (Our unique protein blend consisting of: cross flow microfiltered and ultrafiltered whey protein concentrate, cross flow microfiltered, ultrafiltered and diafiltered whey protein isolate, partially enzymatically hydrolyzed whey protein), low glycemic glucose polymers, fructose, fructooligosaccharides (FOS), L-Glutamine, medium chain triglyceride (MCT) oil, natural flavour, digestive enzyme complex consisting of: (bromelain, lactase, amylase, protease), xanthan food gum, sucralose, carrageenan. Note: Nutritional Facts and Ingredients may vary slightly depending upon flavour.